I've been troubleshooting a starting problem for a month now and several times I have thought that I've found the problem because I make a correction and the car starts fine. Then a few hours or a few days later it goes dead again. I've corrected a bunch of flaky connections and replaced the horn relay, ignition switch and neutral safety switch. My question - what should the voltage be at the starter solenoid with the key in the start position? I am getting a large load when I turn the key and the voltage at the solenoid purple wire is about 8vdc. The solenoid is new. After posting my original question I went to teh car and connected a jumper cable from the negative battery to the exhaust manifold to test the ground to the engine. The car started. I thought taht I had found a problem until I removed the jumper cable and the car still starts. So now it is acting like heat soak but I'm not ready to accept that based on the fact that it has run good for the past week when hot and that it has also died for days where nothing I did helped. I'm stuck. Also has anyone changed the under-hood wiring harness on a first gen with the engine installed. The car is fully assembled and it would be good to hear from someone who has done it. The biggest problem I foresee is the heater blower motor wire which is under the passenger fender. Are there other pitfalls that you know of? Well I saw nobody had responded to you yet, so I thought I would give it a whirl. Maybe you can help me out with some more details. 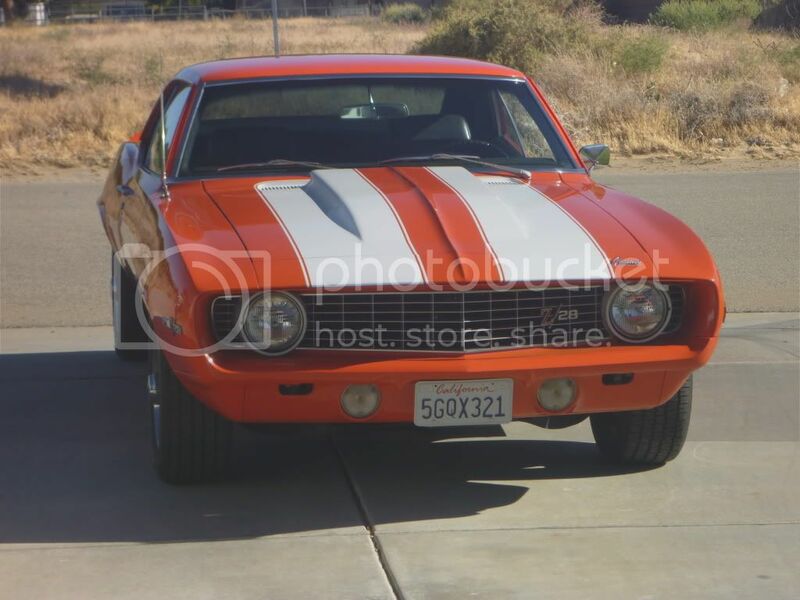 I am guessing this is the 68 Camaro with a 327 you reference in your signature? Do you run headers on the motor by chance? bad grounds will create many a ghost to chase in the electrical system. Clean battery to chassis , coat with some dielectric grease. Check body to chassis ground straps (cooper ones off the fire wall) When I say check ,I'm talking removing-cleaning contact areas-grease. Make sure starter is grounded. Theses are freebie fixes--square that away, and move on to other areas if need be. When you say dead ,engine not turning over ? Or not firing? well I know this is not as exciting a topic as a survivor article, so not as many guys jumping on this topic. I saw he posted 3 times without a response, so I thought, I may not be the know it all but lets get some discussion going to find the solution. Hopefully we can help pin point his issue. Also check for corrosion where the harnesses plug into the firewall, they were known to collect moisture, hence causing issues. I've been through the starting system from end to end checking for voltage drop and have made a bunch of improvements. Each time I made an improvement the car would start for a while and then fail again. Sometimes in hours and sometimes in days. When it fails the starter works fine if I cross the purple wire with +batt at the starter motor. When it fails I find that I only have about 8vdc at the neutral safety switch as opposed to 10vdc when the car is starting properly. There is a voltage drop that I haven't been able to find. I'm working alone which makes it difficult because I have no one to turn the key when I need them. This morning I removed and cleaned the buldhead connector for the second time. It is working fine right now so I am waiting for it to fail again to do more testing. I should have explained that the solenoid does not click. The voltage drops to 8vdc but the solenoid does not switch. It seems like an intermittent connection somewhere along the line. When it doesn't start have you tried tapping on the solenoid to see if it will fire? No I haven't tried hitting the solenoid because i am working alone. But it is the second solenoid in a year. I replaced it along with the starter about a year ago and then again recently when the car dies altogether. It has had an intermittent starting problem for a few years. Yes it is behaving as if it can be a ground that comes and goes. The last time it failed I put a jumper cable from the neg batt to the exhaust manifold and it started. I thought that I was on to something but then when I removed the jumper cable it still worked. I am chasing ghosts. Thanks, I just did that this morning for the second time. The next time it fails I plan to trace the circuit for voltage drop starting at the battery and make my way to the bulkhead connector. I too was hunting down a ghost wiring issue "no start after engine gets hot". I chased everything, grounds, resistance wires. Bottom line I changed the under-hood headlight harness and engine harness with the engine in. Had to snake it in a few places otherwise worked fine. Never could isolate the resistance issue. I imagine buried somewhere in the harness is a burnt wire that goes open or drastically increases resistance after running and hot. I know you might not want to hear this but if I had to do it again, I'd buy new harnesses and just replace them. No use burning a car to the ground for want of a good harness. Now I know yours is not that drastic however the electrical harnesses are 47 years old. I would also recommend if you can't find the issue and are on a budget remove the harnesses unwrap them and troubleshoot yourself. If I'm understanding you right when it fails you have 8 volts. Are you sure you have the wiring correct? Maybe the resistor coil wire hook to the solenoid? 8 volts is marginal to get a starter motor solenoid to operate. They will hold in on less than that once operated. You should have at least 10 volts at the solenoid purple wire to guarantee it will operate. Some volts are still being lost somewhere. You don't need 2 guys to check the solenoid. Once it doesn't start just tap with a screw driver on the solenoid a couple of times. Sometimes a solenoid will stick, and over time will pop back open . So when you go back to the car all of sudden the problem is gone. I have had this happen as a result of running headers to close to the solenoid, and it getting to hot. Example I drove my 66 Chevelle 20 minutes, would park it, and then come back out like 5 minutes later, and it would not turn over. I would either have to wait 15 minutes for it to cool down and un stick, or tap on the solenoid, and presto it would turn over and start up. Once I figured it out I ran a heat shield over the starter and that solved it. This may not be your solution, but it may eliminate it as a possibility. Try this as well when it doesn't start and I guess you are actually saying no crank? - hook up your remote starter switch if she cranks your issue is within the column ignition/NSS/to coil wiring circuit. Been there done that and i'm convinced that it is in the wiring circuit but then I'm stuck on this so maybe I'm wrong. How did you correct it from sticking? I'm thinking that it is in teh bulkhead connector but I've already re3moved it and cleaned teh connections and it looks to be in pretty good shape. I'm getting ready to add a solid state relay at the starter as I've seen other's do. The battery is grounded directly to the engine block via water pump bolt and there is a wire from the negative battery post to the front right fender. I do not have a ground strap from the engine to the body. This is what I'm thinking now but based on my last test I think that it may be the under dash wiring harness. I just removed the fuse box and separated it's two halves so that I can put a volt meter on the red wire coming into the passenger compartment and the purple wire leaving the engine compartment and I don't remember the exact numbers but I think that I was getting over 11vdc in and about 9vdc out teh purple. There is a substantial voltage drop between the bulkhead connector wire in and the on that goes back out to the starter. This is what I'm thinking now but based on my last test I think that it may be the under dash wiring harness. I just removed the fuse box and separated it's two halves so that I can put a volt meter on the red wire coming into the passenger compartment and the purple wire leaving the engine compartment and I don't remember the exact numbers but I think that I was getting over 11vdc in and about 9vdc out the purple. There is a substantial voltage drop between the bulkhead connector wire in and the one that goes back out to the starter. It's not always a 'sticking' problem in the true sense of the word. It can be, but not usually. This particular solenoid design has a 'snap action', they're either fully released or fully operated. When the magnetic flux in the armature [the moving part] reaches 'critical mass', the armature begins to move. This movement causes the flux to increase even further and it's 'game over'. The armature will continue to move, causing ever increasing flux until it is fully operated. So there's a very tight threshold voltage/current which when reached, causes the armature to snap from fully released to fully operated. If there is sufficient losses in the wiring/connections causing the solenoid to not operated, it may be that the voltage is only just below the critical operate point. When you tap the solenoid you can cause a couple of different things to happen which on their own or in combination, may be just enough to get the armature to move when you turn the key to start. You can cause a slightly better connection at either the purple wire, or slightly improved earthing of the solenoid case to the nose cone, or even a slightly better connection of the main terminal on the starter motor side [important for dual winding solenoids]. Any of which may cause a few extra milliamps to flow and get the solenoid over the operate threshold. The other thing is that the tapping may just jostle the armature a bit and cause a slight drop in sliding friction - you've lowered the operate threshold. With regard to heat, yes, this can be a problem. It causes increasing resistance in the solenoid windings = less current = less flux = maybe not enough to operate anymore. But imo, most of the time it is simply exacerbating a problem elsewhere. If you have at least 10 volts on the solenoid wire the instant you rotate the key to start, the solenoid should still operate, though I must admit, that close proximity to headers may be a bit too much of a flaming for any system to put up with, no matter how good everything else is. So it's been over a year now and the car is still starting perfectly. I still have a pretty large voltage drop in the bulhead connector even after adding silver impregnated grease to the connections but the car is starting and I'm good with it. rich69rs - interesting document. It doesn't talk about the solenoid or the spring but changes the entire starter which includes both. I wonder if their changes affect the solenoid, the spring or the starter motor itself. The spring change would help if the starter solenoid would not even pull in. No electricity would be sent to the starter motor windings and the bendix would not move. The extra torque starter would help if the solenoid did do its job, the bendix engaged the flywheel and electricity was sent to the electrical windings. In this situation, the engine would crank slow or it would just attempt to turn over. BTW, thank for responding. As you might guess the car has started fine since late last fall and over the winter, but....just drove the car this past ( warm weekend, pulled up in front of garage. Went back out about 15 minutes later to pull in and nothing....waited about 2 hours and started right up. Pisses me off that put so much money and work into this car and afraid to drive it. Sounds like many things to check.